Sturdy construction, powder-coated steel fence. Spacious interior, suit for 3-5 rabbits. Non-toxic, safety to your dear rabbit, hamster, etc. 3 doors make it convenience to feed or get your rabbits. 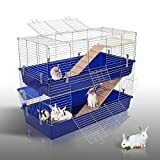 2 storey and 2 trays offers more space and fun for your rabbits or hamster. Beautiful, spacious rabbit cage in an elegant design! • Absolute top design, high quality finish. • Non-toxic, safety to your dear rabbit, hamster, etc. 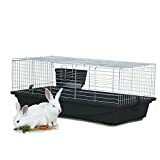 This PawHut small rabbit cage is an ideal home for your small pet, and is a great portable solution. 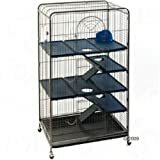 The cage is made with a plastic base with an upper metal cover, and comes with a feeding shelf. It also has 2 doors for easy access from the top and front. This is a great item for any pet lover and will be a great home for you pet.